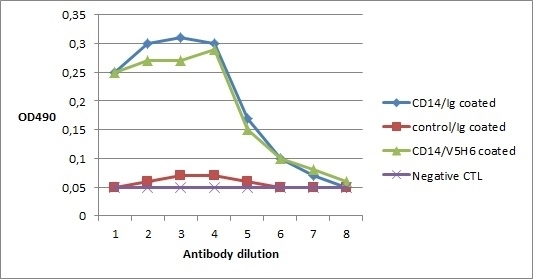 Mouse anti Chicken CD14 antibody, clone AV141 recognises chicken monocyte differentiation antigen CD14, a 465 amino acid GPI-anchored membrane glycoprotein containing multiple http://www.ebi.ac.uk/interpro/entry/IPR026906 . CD14 is a monocyte/macrophage differentiation antigen, belonging to the lipopolysaccharide receptor family, also expressed weakly on microglia and Langerhans cells. CD14 acts as a receptor for the potent bacterial endotoxin, lipopolysaccharide (LPS), facilitated by LPS-binding protein (LBP). The binding of LPS to CD14 results in cell activation and the release of cytokines and the inflammatory response, and has been shown to upregulate the cell surface expression of adhesion molecules. Clone AV141 is one of a range of antibodies that have been developed by the Roslin Institute as part of the Avian immulogy toolbox project. In addition to Mouse anti Chicken CD14 antibody, clone AV141, other antibodies to chicken CD antigens and chicken cytokines from this project are now available from Bio-Rad.